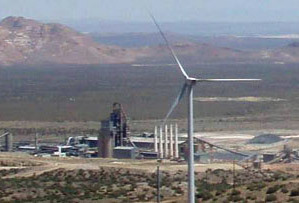 A 24-megawatt project of eight 3-megawatt wind turbine generators "behind the meter" project on California Portland Cement Company's Mojave Cement Plant property. Work consisted of preparation of site plan and grading plan with over 16,000 linear feet of crane and equipment access road to the eight turbine and crane pads. Provided an overhead power line easement to the plant's substation with two Union Pacific Railroad overhead power line crossing applications. Ludwig Engineering can compile accurate computerized GIS and contour mapping on most properties in San Bernardino County, California, and Mohave County, Arizona. Maps can be three feet wide and as long as needed. BLM and other government property can be color coded on the maps. Maps can be prepared quickly and inexpensively for renewable energy site investigations. 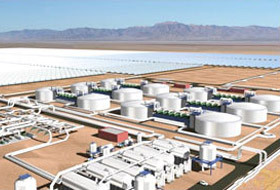 Conducted a study to collect and transmit up to 3.52 MGD of reclaimed water required for cooling purposes by a proposed 4,000-acre and 340-megawatt concentrating solar power (CSP) plant project located in the desert 22 miles north of Kingman, Arizona. This required the preliminary design and costing of more than 90 miles of 18 inch and 14 inch pipe through mountainous and desert terrain and city streets plus 9 pumping stations and 1 large pressure reducing station. Phase 4 - Prepare site plan for 31 wind turbine generators on two-square mile project on Oak Creek's property. 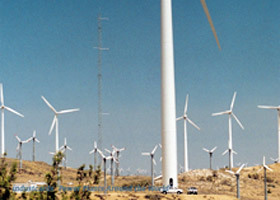 Phase 3 - Prepare Site plan for 20 wind turbine generators on two-square mile project on Oak Creek's property. 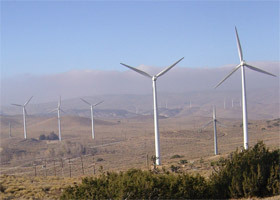 Lehigh Southwest Cement Company Tehachapi Plant - Prepare preliminary site and grading plan for eight wind turbine generators for a "behind the meter" project on Lehigh Southwest Cement Company's property. NREL Test Site - Prepare site and grading plan for NREL test site on Oak Creek Energy Systems' property. Phase 2b - Prepare site and grading plan with access and equipment roads for two 800kw and three infill wind turbine generators on Oak Creek's property. Phase 2a - Prepare site and grading plan with access and equipment roads for two 800kw wind turbine generators on Oak Creek's property. Phase 2 Repower (M&N; Wind Power) - A 33 NEG Micon 700kw wind turbine generator repower project covering two square miles. The project included a site plan and grading plan for the project with crane and turbine pads that tied to existing access roads. Phase 1 (ON-Energy) - Prepare site plan for 7 NEG Micon 600kw wind turbine generators.